Yes, this is certainly news! 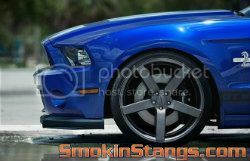 I mean WOW..."this is real life Fast & Furious movie type of stuff" says SmokinStangs. Rumor has it that these seven GT350's were apparently already spoken for, as they were specific orders (Thus the use of the term "CUSTOM" via the original story). Oddly... during the event, one of the GT350's was found burn & scorched to the ground. Some speculate that it had to do with perhaps the "Transport Mode" (AKA: for....Limp Mode) setting that these are set to in preparation of delivery. Perhaps....someone got pissed off due to the fact that it was falling behind (too slow for a get away) so maybe they decided to torch it? Bolt cutters to cut through a fence and then they were able to drive them off the plant lot???????? Maybe some new Security Changes!!! Hopefully Ford builds 7 more for those people or the Authorities recover the 6 out there. *Formerly only90s, but all the 90s are gone..
2016 Ford Mustang GT350 - Has all the the makings of a STUNNER!! 2016 Ford Mustang SVT / GT350 testing on the Nürburgring!